every woman’s easiest go to outfit. 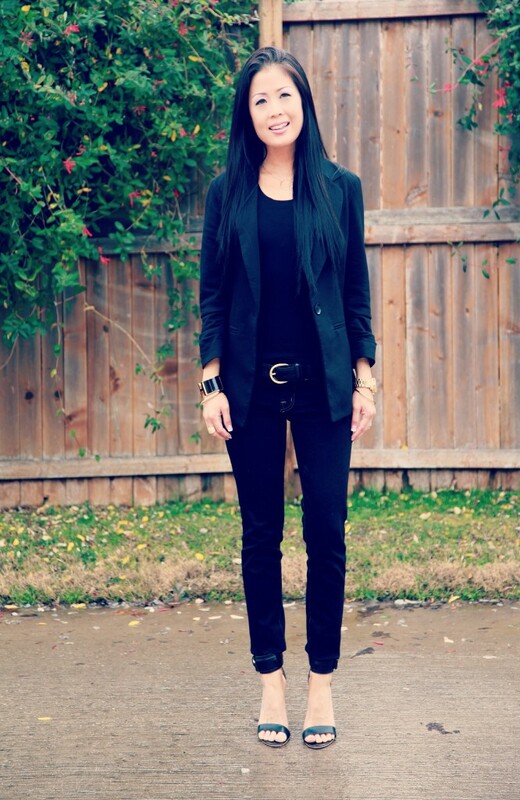 A black blazer is another blk must (staple) in every woman’s wardrobe. Out and about all day but have somewhere you have to go at night? It’s the easiest- packing lightly! A couple simple garments can immediately turn something more casual into something a bit more polished and chic. Just add a blazer and a pair of heels. Oh I do love black on black and you wear it beautifully my friend. Black is so classic and chic. You look fabulous! Black jacket is my favorite.. I am looking fot med high heel sandal..hard to find. Any idea? I absolutely love this look. All black is my favorite go to look. Thanks for the recent comment on my blog. You look really so chic and elegant and that shoes are amazing. Have a great day. Love your look, it’s stunning! I think nothing is more chic than all black! You look gorgeous! 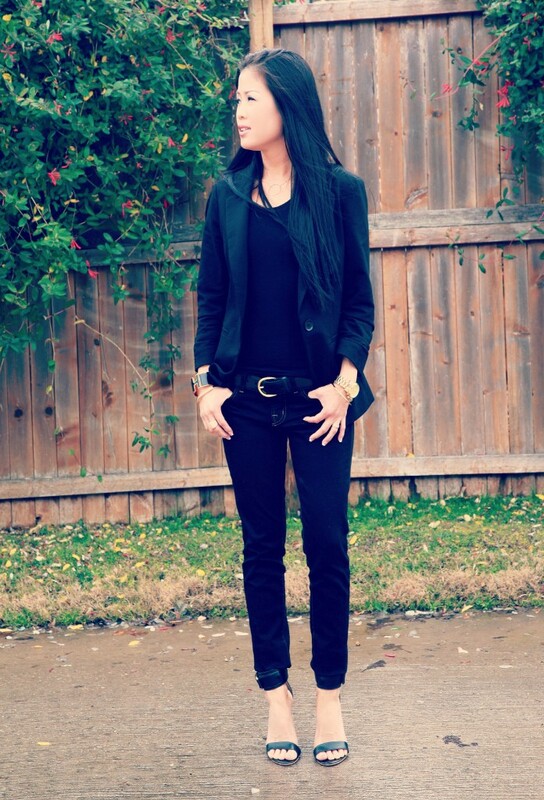 Love the black on black & my blazers are one of my staples too! The armfuls of gold accessories are a great touch! So chic and classic… kind of funny that I’m dressed almost identical today… he he he… love it girl!! Those heels are amazing! I love how simple and chic they are! I love the all black, you look so gorgeous and so chic! such a chic and elegant look, black on black is always a favorite of mine. you look absolutely incredible dear. Super cute outfit! I love that blazer and your shoes. Classic and chic. You can never go wrong with black! seriously black on black is ALWAYS a winner! loving this look lady! I think black on black (on black) is so so chic. You really can’t go wrong! Black on black <3 so chic! I simply looove that mix! You are right. This is a chic yet subtle way of looking so classy. Love it. I love the black on black combo. You look causal, chic and sleek. Plus I love your heels. You are so right when you said all black is a great go to outfit. Love how simple and chic you look Sooae! thnx inna! oh no, i can never in colder weather. I wish i could! This outfit shot was actually takin last month…in 75 degree weather haha! XO!! Absolutely gorgeous, I love black on black on black! You look great head to toe black, chic!!! Lovving this post!! nice blog! Love the black on black on black! So simple & chic! looking stunner in all black!! thanks tat- its obv a staple in my wardrobe. can’t seem to stay away. xO! So chic, I love your belt! You look gorgeous as always. Looking chic as ever in an all noir look! I love it. You know I love an all black outfit!! Simple and so so so chic, as always Sooae. You look great. I love all black outfits. 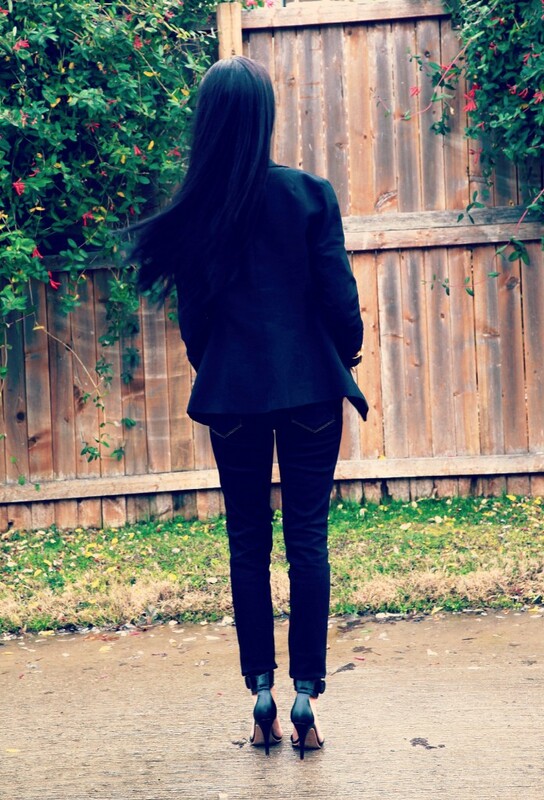 I agree black blazers are a staple. I own several and they get worn regularly. You epitomize chic!!! Love this! Girl you look so good in all black! You are one of the only people who can pull off this look Sooae! That’s funny that I was thinking to call my post “Black on Black with Black”! Love your outfit, as always! I totally agree with you. You can never have too much Black! Love your all black look. So gorgeous! I completely agree. . . black on black on black is one of the most chic combinations. You look fabulous! black on black is perfection! love this! You look great, Sooae! Totally agree with you there. I’ve been looking for a good fitting black blazer for sometime. love this black sleek look! It’s so chic! Nice outfit! I love the all black! I actually have a black blazer myself but I never wear it! I totally should bring it out soon! you always rock black soo well, sooae!! soo hot!! Uber classy…..head to toe black is always the way to go!!! You’re always so HOT!!! Follow me back, would be great!! Let me know, do you have a Fb page also?? A good blazer always does wonders for upping the outfit, such a key piece of clothing! Looks wonderful!